UPDATED 5-16-17: See the new asterisk on our number 2 recommendation based on a policy change (for the worse). Pet insurance can save your pet’s life. Veterinary medicine has rapidly advanced in the past 10 years and we can now diagnose, treat, and cure more rapidly, accurately, and with less morbidity (pain, suffering, etc) than ever before. The problem with these advances – they’re expensive. Our clients have told us stories about how one trip to the emergency room cost them over $10,000. While those super expensive trips are few and far between, it is not unusual for an average emergency room visit to cost $3000. When pet owners aren’t prepared for that, it can mean that the family pet is euthanized and this reality is heartbreaking. This is why we recommend whole heartedly for all of our patients to have pet insurance. No one wants to make the decision between providing food or paying rent, and you pet’s life. The other problem is that choosing a pet insurance plan is completely overwhelming. Its really hard to know if what you are signing up for is actually good insurance. After listening to hundreds of confused clients, we decided to weed through the details and see if we would find major differences between the plans. And we did. Disclaimer: We are not insurance agents, brokers, or insurance experts. This is not insurance advice. We do not receive kickbacks from any of our recommendations. However, we are well positioned to write this because we are experts in veterinary medicine and know the financial fallout if a company excludes hereditary conditions or a knee surgery, for example, because those exclusions can cost you thousands of dollars. 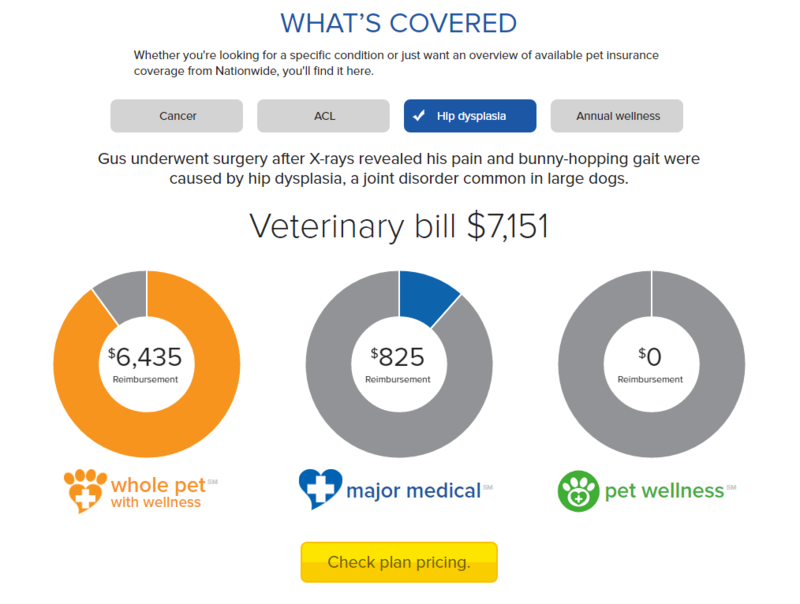 You can see that theMajor Medical Planleaves a $5,610 gap in reimbursement compared to a more standard pet insurance policy for hip dysplasia and $6,177 gap for cancer. These are huge holes that would prevent most people from being able to treat their pets because the plan isn’t providing coverage like it should. Nationwide will cover any condition (provided it is not pre-existing) once the policy has been in place for 14 days. If your pet injures themselves on day 15 – they will be covered. This is a big deal because most companies will not cover any knee or orthopedic conditions for 6 months to a year after the policy has been in place. With Nationwide, it is immediately covered. They coverallwellness recommendations. Previously, pet insurance companies that covered wellness would charge an extra $15-50/month extra and have a defined reimbursement that usually would not cover the actual expenses and would be limited to certain wellness recommendations. For example, a “wellness plan” would reimburse $75/year for flea medications when most flea medications cost over $200/year but wouldn’t cover annual bloodwork or cancer screening. 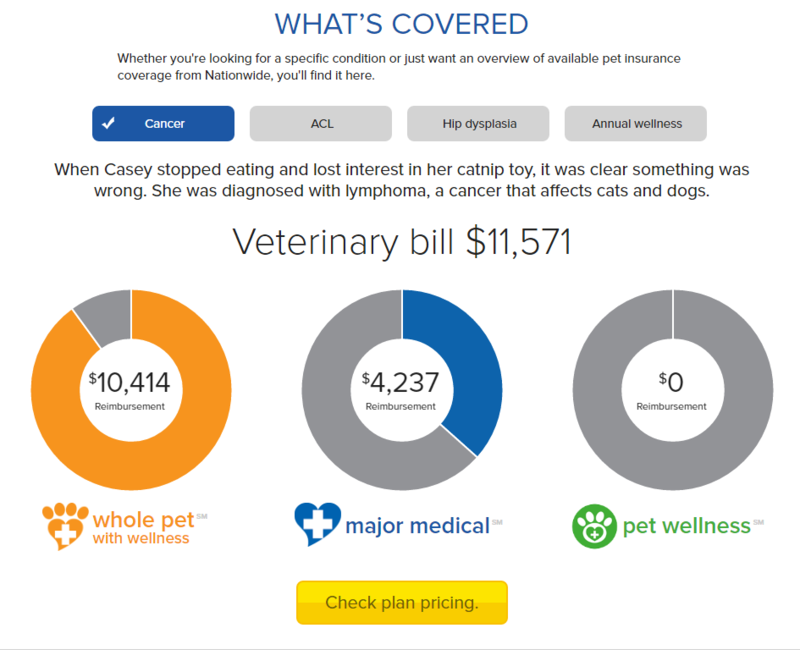 There are a few other variations on this theme, but basically the typical pet insurance “wellness coverage” plans were not very helpful or cost effective. This new plan will reimburse (after the $250 deductible has been met) 90% of all recommended wellness items. This includes exams, vaccines, flea and heartworm medications, annual bloodwork, cancer screening, even spays, neuters, and other recommended procedures such as a preventative gastropexy. Dental cleanings. If we determine your pet has periodontal disease, they will cover the cost of the dental cleaning from start to finish. Our top 3 pet insurance companies all do this and is one of the biggest factors in choosing a pet insurance company. Note: If your pet has pre-existing dental disease, it will not be covered until you have a dental performed and then they consider that disease “cured” and will be eligible for coverage when the next dental is needed. Prescription pet food. Here is another industry first: they cover prescription pet food without limitation at the standard reimbursement rates. Cost. While they are not the cheapest plan on the market, they tend to fall right in the middle of the pack. However, when taking into consideration all of the additional benefits and what they cover, we feel the price point is a steal. Their website. Its terrible. It doesn’t provide details without a lot of searching and clicking. Overall we found it to be a frustrating experience. Plus, they are still trying to direct people to their other plans (see below) and we wish they would just remove them from the site all together. They still offer those plans we talked a lot of smack about. We only recommend signing up for Nationwide’s WHOLE PET with WELLNESS. Avoid like the plague their other 2 plans –Major MedicalandPet Wellness. These are still on the antiquated set reimbursement benefits (only reimbursing up to a certain amount for a variety of selected diseases that are not always based on actual costs incurred) that can leave big gaps in the costs associated with getting your pet back to health (see the above images). We still have reservations about recommending Nationwide because these other plans can lure people in with lower prices but will bite their policy holders in the rear if their pet ever ends up in an emergency hospital. Don’t be fooled, the devil is in the details. They won’t even issue policies for pets with certain pre-existing conditions – Addison’s disease, diabetes, or cancer. If your pet has one of those, you will have to look elsewhere for pet insurance. Overall, this is the best plan money can buy – and it isn’t even that expensive when compared to other pet insurance companies. While there are less expensive plans (Figo, see below), they don’t come close to offering what this plan does and this is why they are getting the top spot in 2016. They are the newcomers to the pet insurance world and were started in an incubator which is part of Google’s Tech Hub Network. Their goal is to merge technology and pet insurance though it remains to be seen how useful all of their tech will be. Some features do seem nice, such as the ability to text in invoices and ask questions. In terms of their plan – they have a great plan. They appear to have copied Pet Plan and made some improvements such as an annual deductible instead of a “per incident” deductible which is a big plus. They excel not only for their technology, but also because they have a great price point for their plans. They typically come in lower than most other pet insurance companies and have better coverage. However, in investigating their fine print details, we found one point that was going to be a huge downside to their policy. Their fine print stated that if your pet tears their cruciate ligament they will cover the first surgery. However, if your pet tears the ligament of their other knee within 12 months (which happens in about half of all pets with a torn knee), they will not cover the second surgery potentially leaving the unsuspecting pet owner with a $3500-5000 bill. This was a really bad policy and a big loophole that we didn’t find with any other company. What is the point of an annual maximum benefit of $10,000, $14,000, or even unlimited if they have fine print which prevents you from being able to use it? Well, we brought it to the attention of the company and because of our investigation and action, they have now removed that exclusion and both knees are now eligible for coverage! Way to go Team Coastal! Overall, they (now) have excellent and comprehensive illness and injury coverage at a great price and we highly recommend them. *UPDATE 5-16-2017: We have recently learned of another policy change with Figo, unfortunately this one is for the worse. They no longer consider “periodontal disease” a coverable disease. This policy change will mean any dental cleanings we perform will be an out of pocket expense for you and will ultimately lead to more chronic pain in animals. However, our #1 recommendation, Nationwide Whole Pet with Wellness, and our #3 recommendation, PetPlan (below), both cover dental cleanings and can save you a lot of money in the future. 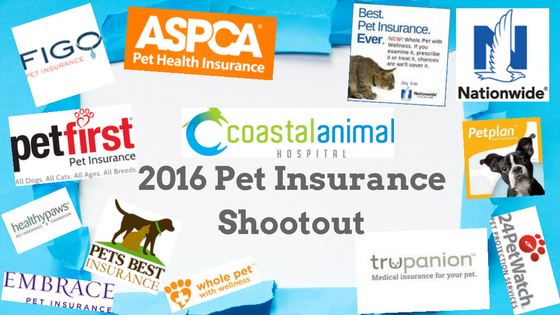 Pet Plan was our 2014 Pet Insurance Shootout Winner. At that time, they really set the bar on best practices in the pet insurance world and many companies have scrambled to catch up with them and try to beat them. Unfortunately, Pet Plan didn’t keep up and is now trying to transition and claw their way back to the top but they aren’t quite there. They still have great coverage. However, they are just now starting to offer an annual deductible in addition to a per incident deductible. The problem with their annual deductible and why they didn’t edge out Figo for the number 2 spot is the cost of their plan is almost 75% more expensive than Figo. Per incident deductibles aren’t as beneficial as annual deductibles because if you pet has 3 different problems throughout the year (an ear infection, a UTI, and an upset stomach), you have now paid your deductible three times instead of once. If their plans become a little more price competitive, then they could secure or at least tie the number 2 spot, but until then, they fell to the (still respectable) number 3 spot. Trupanion: They don’t cover exam fees. This is a big deal because it discourages bringing your pet in for follow up/recheck examinations which can delay recovery, healing, etc and is a sneaky extra deductible every time your pet needs to be seen. They do have some good features (chronic diseases are not subject to annual deductible), but also some other downsides such as no coverage for periodontal disease and will exclude coverage for knee surgery if the other knee had problems in the past. Embrace: They seem to be good overall, however, they exclude periodontal disease as a coverable condition, so if we recommend a dental, they won’t help. They do have a “wellness plan” which will cover part of a dental but is limited by the amount of “wellness coverage” you have. Pet’s Best: The founder started the first pet insurance company and has a great story. However, they have a few downsides such as only covering medications that are in their “formulary” (if it isn’t in there, no reimbursement. This can be a big deal with certain name brand medications and/or cancer drugs). They don’t cover periodontal disease and also exclude coverage on a second knee injury if the policy wasn’t in place prior to the first knee injury. Pet First: They do get an honorable mention as their Lifetime Coverage plan is fairly comprehensive. However, their fine print excludes removing retained puppy teeth, 12 month waiting period for back surgery, and most importantly, we consistently have had very negative customer service experiences with this company. In doing the research for this article, one rep told us “I was taking up his time” and was pretty rude. We have also had several incidents where Pet First claimed to have not received faxes for insurance claims and seems to mysteriously misplace paperwork. Healthy Paws: They don’t cover the exam fees like Trupanion making their annual deductible also have another sneaky per incident deductible. They also exclude dentals, behaviorists, and exclude the other knee from any coverage if the first knee already had a problem. ASPCA: They have lots of exclusions, confusing policies, limits on congenital and hereditary conditions, and overall have not simplified and streamlined their plans to be efficient, comprehensive, and cost effective. Their plans are reminiscent of where pet insurance was 5 years ago. 24 Hour Pet Watch: They have the same apparent underwriter and policies as ASPCA (Level 1-4) with identical website layouts and confusing terms. It looks like Hartford lets companies like ASPCA and 24 Hour Pet Watch just private label their product. 24 Hour Pet Watch doesn’t do much to even private label their insurance because when you try to get a quote, you are redirected out of their site to Hartford’s site. This company is not in the game to really give you a great plan and also had bad customer service when we called to get information. We hope that you found this helpful. Again, almost any of these insurance companies are better than having nothing. PLEASE NOTE: If you already have a pet insurance plan in place and your pet has a chronic disease or pre-existing condition, you cannot switch to another company and expect them to cover that disease. It will be considered a pre-existing condition for that company and excluded from coverage. If your pet isn’t being managed for any chronic diseases – then you are ok to switch if you want to upgrade, just do your homework. Do you already have insurance with any of the companies we mentioned? What was your experience? Do you have a company that we missed? Let us know if the comments below. Here’s to anxiety-free pet ownership! Thank you very much for all the info and putting your time in it to explain everything to the details and especially from a side of a Vet. I definitely will sign up for one of the recommended one, I will get quotes first and of course have to bring in my little ankle biter JANE first if she has any existing health issues. I miss you guys a boatload! Thanks for this synopsis. I’ve shared it on FB and will be changing to an even better insurance company than I already have with my next dog, thanks to you! What’s Wrong with Anesthesia Free Dental Cleanings? Should I let my cat go outside? The indoor vs. outdoor cat debate. Why does my chihuahua/yorkie/shihpoo/(other dog that fits in my bag) get the same vaccine amount as a Great Dane?